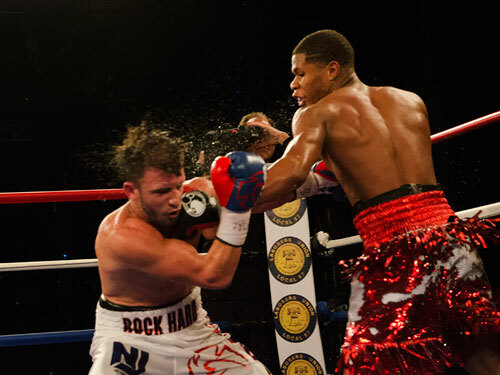 In the nationally televised main event at South Philly’s 2300 Arena, Las Vegas lightweight Devin Haney, 19-0, 13 KOs, won the vacant USBA title by overwhelming Mason Menard of Rayne, LA, 33-3, 24 KOs, scoring a TKO after the ninth round of their scheduled 10-rounder. Haney methodically dominated every round of the fight, banking round after round on the scorecards. There were no knockdowns during the contest, and Haney never went for the kill. He just circled and threw blizzards of punches at his over-matched foe, seemingly content to go the distance, win a decision, and collect his belt. 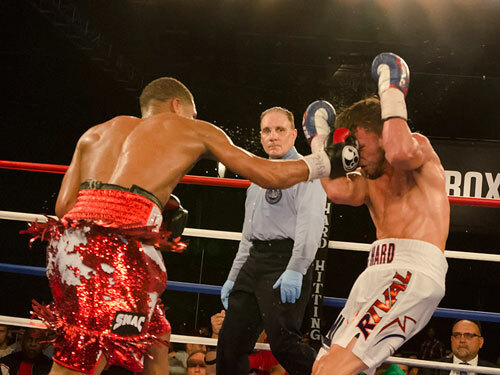 However, after nine full rounds of this monotonous beat-down, Menard’s corner decided that enough was enough and asked referee Gary Rosato to stop the fight. It was a merciful ending for all of us. 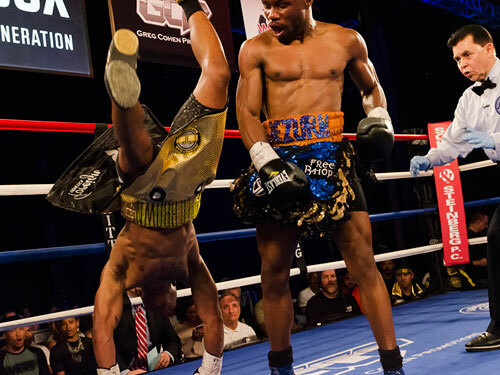 Haney is abundantly skilled and very well may be a star of the future, but he is not yet an entertainer in the ring. The TKO came at 3:00 of round nine, and with it Haney added the USBA belt to his collection, which already includes the WBC youth world title strap. 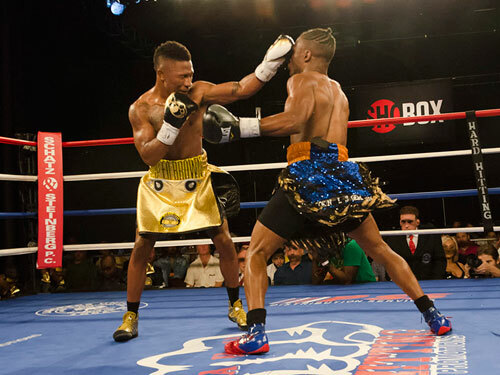 Junior featherweights Joshua Greer Jr. of Chicago and Glenn Dezurn of Baltimore put on a testy, high-level scrap in their scheduled 10-rounder. The pair fought fairly evenly for seven rounds. As they entered the eighth, I had Dezurn up four rounds to three, but a couple of the sessions were rather close. However, Greer turned it up in round eight and managed the TKO just when it appeared the fight might be going the full distance. In the early going, Dezurn was the aggressor and seemed to have the power and work rate to eventually get the win. Greer appeared happy to just follow and smile while Dezurn gained control. However, toward the end of the second round, Greer rallied just before the bell. In the third, a right uppercut by Greer hurt Dezurn and drove him across the ring. Yet, it was Dezurn who came back in the fourth to win the round. 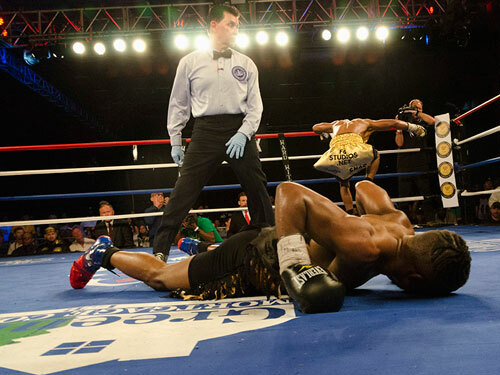 But Greer began working hard to the body and it had an effect on Dezurn by the end of the fight. Greer won the fifth and sixth with sharp rights, both straight and uppercuts, but the fight was still a competitive two-way. Dezurn took the seventh round on my card and went into the eighth with a slight lead. However, things were about to change for good. In the eighth, Greer landed a pair of right hands that put Dezurn down. Slightly fading, but still full of fight, Dezurn got up and continued. However Greer resumed the attack and pinned his damaged opponent on the ropes. 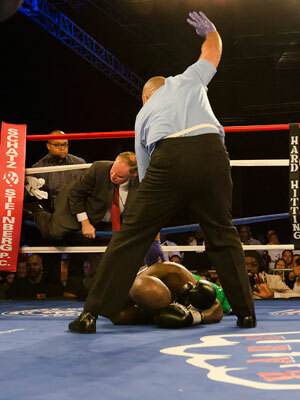 There he fired away until referee Benjy Esteves stopped it. Still full of fire, Dezurn threw one more punch as Esteves pulled Greer away, but it was too late. The time was 1:47 of the eighth round. Greer improved to 17-1-1, 9 KOs. Dezurn slipped to 9-2-1, 6 KOs. 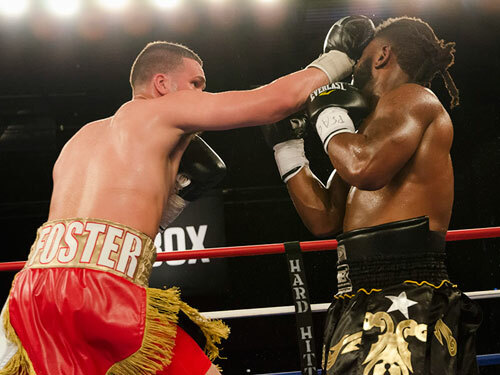 In a rugged light heavyweight fight, New Haven, CT southpaw Charles Foster remained undefeated, 16-0, 8 KOs, with a unanimous verdict over Alvin Varmall, Jr. of Catskill, NY, 15-1-1, 12 KOs. This was an exciting duel, especially in the first half, when it seemed certain that the fight would end in a knockout. The only question was which bruiser would come out on top. 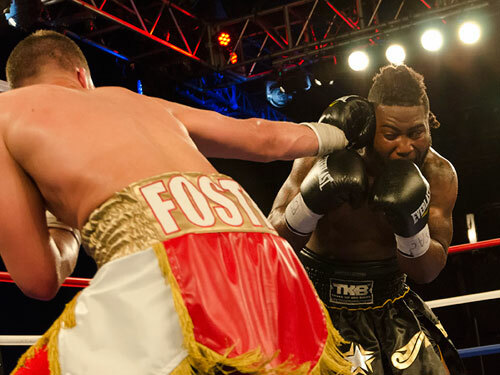 Foster edged the close first round, but looked bigger and meaner than Varmall. However, in the second Varmall turned up the heat and suddenly he looked destined to be the knockout winner. The fighters swapped like this for the first four or five rounds. The fight was like a nasty tennis match. However, beginning in the sixth, the intensity sapped a bit and Foster took control down the stretch. He was winning, but now the prospect of a KO looked seemed to be fading. They went the full eight rounds and Foster, with his better work rate took the decision by scores of 78-74 (Pierre Benoist) and 79-73 (Dana DePaolo) and 77-75 (Steve Weisfeld). My score was also 78-74 for Foster. 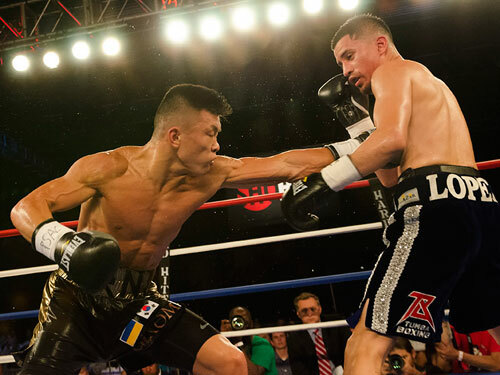 In an 8-round junior featherweight bout, Arnold Khegai of Odessa, Ukraine, 12-0-1, 8 KOs, won a unanimous decision over San Antonio’s Adam Lopez. 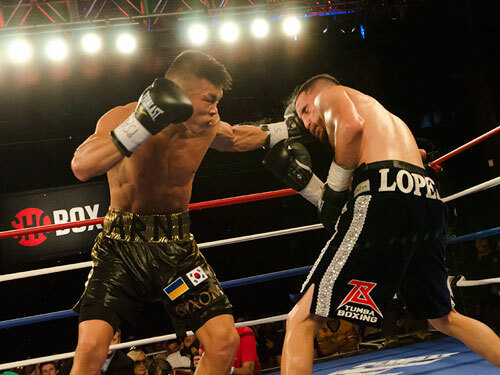 Khegai staggered Lopez in round two and was penalized one point in round six for hitting on the break. This was also a back and forth bout, but Khegai was stronger and more energetic than Lopez. After eight rounds, Khegai was ahead on the official cards 78-73 (Lynn Carter) and 77-74 twice (Dave Braslow and Dana DePaolo). 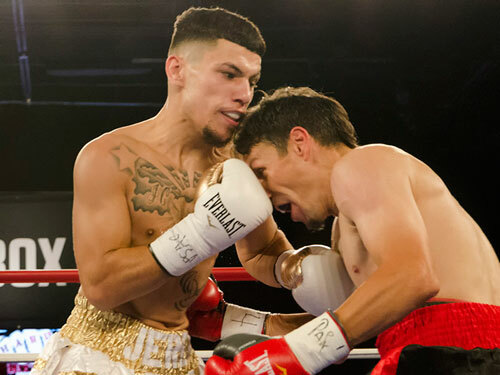 Philly’s Jeremy Cuevas, 9-0, 7 KOs, won by second round TKO over Hector Marengo, of Arecibo, PR, 7-12-4, 4 KOs, in a scheduled 6-round lightweight bout. The southpaw swarmed Marenga in round two, dropping him once. When Marenga got up, Cuevas pounded away until referee Shawn Clark jumped in to save him. The time of the stoppage was 1:51 of the second. This was the final off-TV bout before the Showtime telecast began. 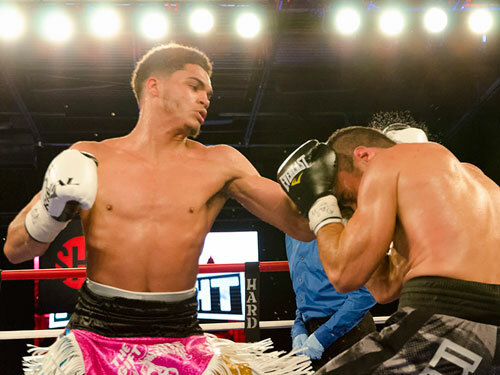 Rising teenage junior welterweight Branden Pizarro of Philadelphia, 10-1, 4 KOs, won a shutout 6-round decision over Mexican Israel Villela, 5-10, 2 KOs. Pizarro had all the advantages in this one and the result was never in doubt, yet Pizarro failed to press Villela enough to even try for a knockout. It is a safe bet that had he tried, the KO would have come. All three official judges scored the bout 60-54. In a scheduled 6-round light heavyweight fight, Craig Duncan, Apopka, FL, 11-1-1, 9 KOs, scored a brutal fourth round knockout over Wilmington’s David Murray, 7-2-1, 6 KOs. Duncan first dropped Murray with a right, but David survived. However moments later, Duncan landed another right that sent Murray crashing face-first to the canvas. Referee Shawn Clark immediately stopped the fight without a count. The time of the KO was 2:45 of round four, and the fight is a serious contender for the “Knockout of the Year” in Philly. Murray is no stranger to taking big shots and finding himself on the canvas. Several of his previous bouts have included downward trips for Murray. However, he usually somehow manages to climb to his feet and pull off a miracle comeback. Not this time however. The knockout punch was so devastating and his fall to the floor so heavy that there was no way he could have continued. Murray remained on the canvas for several scary minutes while the emergency medical crew attended to him. Luckily he left the ring on his own power and his stay at the hospital was reportedly brief. Murray is a good man and a decent fighter, but this nightmare looked like a possible career ender. In the opening fight of the night, Philly lightweight Milton Santiago, 17-0, 3 KOs, ended an 18-month layoff with a one-sided unanimous decision over Honduran Jorge Luis Munguia, 13-12, 5 KOs. 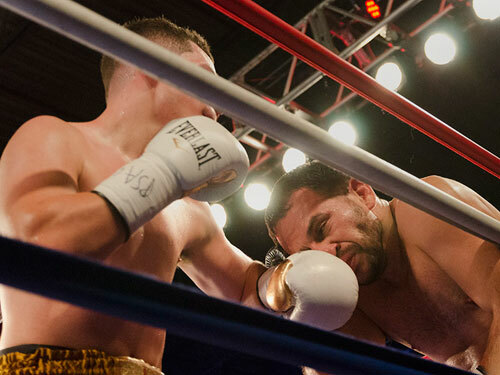 Santiago scored a knockdown in round one, but had to settle for a wide-margin win by scores of 60-54 and 60-53 twice. My score was 60-53 in favor of the returning prospect. Let’s hope he can stay active now that he’s back. 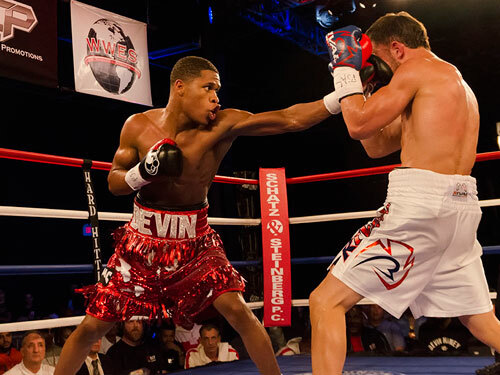 The eight bout card was promoted by Hard Hitting Promotions, Greg Cohen Promotions, and Devin Haney Promotions. Showtime televised the final four fights. Approximately 900-1000 fans attended.